Textile industries produce a great quantity of water contamination by dyes. Such contamination is a serious environmental problem because dyes diminish oxygen and light penetration to the water body, producing severe damages to aquatic ecosystems and their biota, besides many dyes are toxic and carcinogenic. White rot fungi (WRF) are beneficial organisms in bioremediation due to their powerful ligninolytic extracellular non-specific enzymes, which degrade not only wood but also a great variety of complex toxic substances, including hydrocarbons, industrial dyes, etc. In this research, we evaluated the decolorization effect by three decomposing wood mushrooms, Pleurotus pulmonarius, Trametes versicolor and Lentinus crinitusin a textile effluent and methylene blue dye. For the industrial effluent at pilot scale,P. pulmonariusgave best results with 40% decolorization after seven days. The other two fungi did not give good results in this same experiment, but T versicolorreached 97% decolorizationin methylene blue, at 400 mg/L in laboratory scale, equallyP. pulmonarius and L. crinitusproduced similar but slightly less decolorization. Those results letus conclude that the fungal strains used here have good potential as a tool in industrial colored water bioremediation, especially P pulmonarius andT. versicolor. Las industrias textiles producen gran cantidad de aguas contaminadas con colorantes. Esto es un grave problema medioambiental, porque los colorantes disminuyen la penetración de oxígeno y luz a los cuerpos de agua, lo que afecta negativamente el ecosistema y su biota, además muchos colorantes son bastante tóxicos, cancerígenos y teratogénicos. Los hongos de la pudrición blanca (HPB) son organismos capaces de degradar muchas sustancias tóxicas, gracias a su poderosos sistema de enzimas lignolíticas, que por su baja especificidad, degradan no solo la madera, sino también una gran variedad de sustancias complejas, como hidrocarburos, colorantes industriales, etc. En esta investigación, se evaluó tres hongos descomponedores de madera: Pleurotus pulmonarius, Trametes versicolor y Lentinus crinitus, para decolorar un efluente textil y el colorante azul de metileno. Para el efluente industrial a escala piloto, los mejores resultados arrojaron decoloración del 40% en 7 días de tratamiento con P. pulmonarius, y menores valores producidos con T. versicolor y L. crinitus. El colorante azul de metileno a 400 mg/L, escala de laboratorio,fue decolorado en un 97% por T. versicolor en 7 días, para valores similares aunque ligeramente inferiores con los hongos P. pulmonarius y L crinitusen este mismo experimento. Los anteriores resultados permiten concluir que las cepas fúngicas usadas son potencialmente útiles en procesos de biorremediación de aguas contaminadas con colorantes industriales, especialmente P. pulmonariusy T. versicolor. Palabras claves. Decoloración de aguas, colorantes textiles, hongos de la pudrición blanca, Pleurotus pulmonarius. The textile industry is one of the most important productive sectors in Colombia, with more than 450 textile producers, representing more than five percent of total national exportations 1. Although this sector is so productive, it threats the environment seriously because it generates a lot of water contamination, especially by using synthetic dyes, which most of them are toxic and carcinogenic2. There is polluted more than 7x10 8kg of 10.000 different industrial dyes in a year, most of them used in fabrics dying. Some estimations how that 10-15% of those dyes used in dying processes are discharged to water streams3. When a natural water stream was set with dyes, there are produced various negative consequences in it, like diminishing of oxygen solubility, less light penetration, among others. All those consequences stop aquatic photosynthesis, so there is a direct inhibition of aquatic biota growth. Usually, the most common values of dye concentration in industrial effluents are around 300 mg/L, but the color in water is very notable even at a concentration of 1 mg/L. 4,5. For diminishing color in water, there are various physical and chemical methods, such as adsorption3, oxidation 6, chemical degradation, photo-catalysis, ozonation, and others7. Although those methods offer high color removal percentages, they have various disadvantages like their high costs, their tendency to produces significant quantities of sludge, and some of them generate other compounds even more toxic than dyes 8, 9. One of the most attractive alternative to reduce color in industrial effluents is the use of white rot fungi (WRF),which are organisms capable to feed from very hard vegetal tissues like wood, because of their powerful ligninolytic enzymes (laccases, lignin peroxidases, manganese peroxidases, and others), which break up the main components of wood: lignin and cellulose, 2,10. As those enzymes are substrate non-specific, many investigators have researched WRF not only to degrade synthetic dyes but a great variety of complex toxic substances like hydrocarbons11. Besides the use of such organisms for water decolorization is said to be environmentally friendly, and less expensive than physical and chemical methods8,12. In this sense, many recent papers demonstrate the high efficiency of water decolorization effected by various species of WRF on a great variety of industrial dyes. For example, using Pleurotus spp10,14; Trametes versicolor9, 10, 13-17and Lentinus crinitus2,14,18,19. Methylene blue is a standard dye, mostly used by industries like textile, paper, rubber, plastics, leather, cosmetics, pharmaceutical and food industries 3. This dye is a toxic substance to water microbiota and humans 20, equally it is known as a teratogenic substance 21. The decolorization of methylene blue at laboratory scales have been researched by using various physical and chemical methods 20, as well as by using few WRF 22,7,nevertheless there are very few papers showing decolorization of real industrial effluents in non-sterile conditions 24, equally there are no published data about methylene blue decolorization in non-sterile conditions by using the specific fungi used here: Pleurotus pulmonarius, Trametes versicolor and Lentinus crinitus. The purpose of this paper is to present the water decolorization obtained in a real textile colored effluent and methylene blue, at pilot and laboratory scales respectively, by using the WRF Pleurotus pulmonarius, Trametes versicolor and Lentinus crinitus. Three fungi Pleurotus pulmonarius, Trametes versicolor and Lentinus crinitusused in the decolorization experiments were obtained from the strain collection at the Universidad Catolica de Oriente mycology laboratory. The preserved strains in tube cultures under mineral oil11.The cultures were transferred to Petri dishes with solid medium [G33] PDA (potato dextrose agar, OXOID) in sterile conditions and incubated at 24°C until full colonized. The cultures obtained were maintained at 4°C and used to produce mycelium using as substrate 2 kg hay (Digitaria decumbens) blocks, with 65% humidity, in polypropylene bags, under sterile conditions, with 20 days’ incubation at 24°C. The full-colonized mycelium blocks, were used to evaluate decolorization in the industrial colored effluent or two concentrations of methylene blue, according to the following experiments. This experiment was set at the water treatment plant “La Cimarrona”, Marinilla, Colombia, which receives and purifies various industrial colored effluents, from various dyed fabrics manufacturers. This colored industrial effluent (table 1) was used to evaluate the decolorization by the three fungi grown in the way into a pilot reactor, and two different liquid-mycelium contact ways: 1) submerged entirely blocks or [G38] 2) percolation of the liquid through a mycelial block (see figure 1). Table 1. Some characteristics of methylene blue and the industrial colored effluent used in decolorization experiments. Figure 1: Pilot scale reactors for decolorization of industrial colored effluent assays were 150 liters’ plastic drums containing 50 liters of effluent, in two contact ways. A: effluent recirculated through the mycelium block suspended in a basket. B: Totally submerged mycelium block under the water, both had the same recirculation system. Into the reactor (150-liter plastic drums ) were put 50 liters of the colored effluent and it is respective 2 kg mycelium block, which was either submerged entirely or suspended into a stainless still basket, 20 cm above the liquid level. For both methods, a recirculation of liquid was set constantly using an aquarium pump, with discharge at 80 cm height, caudal of three L/min, passing over the mycelium basket (contact method one), or falling directly to the mother liquid (contact method two). This set was let at ambient temperature (17 °C average in Marinilla, Colombia), kept from rain and sun. A control test was made using the same reactor and circulation system, with the same effluent but without any mycelium. Experiments and control were made by triplicate. Daily samples were taken during seven days to measure decolorization. After the seventh day, the mycelium blocks were put in a humid shade place (60% relative humidity, 17°C), to register fruiting occurrence during the next ten days. Similar mycelium grown in was used to inoculate Erlenmeyer’s containing either the industrial colored effluent or methylene blue (Analytical, Vasna, India) at 100 or 400 mg/L dissolved in non-sterile tap water. Every 250 ml Erlenmeyer contained 100 ml of the colored liquid and 2 g of the mycelium. The controls were the effluent and both methylene blue concentrations without mycelium. All flasks were incubated on a rotary shaker at 120 rpm, 24°C for seven days, with experiments mounted by triplicate. Here Ai is absorbance of the colored solution without treatment and Af is absorbance after a period of contact with the fungi. All data of treatments were analyzed by variance analysis ANOVA, along with comparisons by Tukey multiple range test, using Statgraphics Centurion XVI 16.1.18. All graphics were made using excel 2013. Figure 2: Absorbance spectra of the colored industrial effluent (A), and methylene blue (B), images are photos from the machine´s display. In Y is absorbance, X represents wavelength. After seven days, the effluent was decolorized efficiently only when mycelium blocks were set entirely submerged, with best values of40,1% by Pleurotus, that is statistically different from Trametes (5,1%), Lentinus(5,5%) and the control (2%), (figure 3). On the contrary, all three mushrooms set in percolation method produced very low decolorization with all three mushrooms, with average media values of 5,5; 1,9and 5,2 % with Pleurotus, Trametes and Lentinus respectively (fig 3). These results are not statistically different from the control (3,4%), evaluated with Tukey multiple range tests (P ≤ 0,05). Ten days after finished the decolorization experiments,100% of Pleurotus blocks produced fruiting, whileTrametes and Lentinus did not produce fruiting. 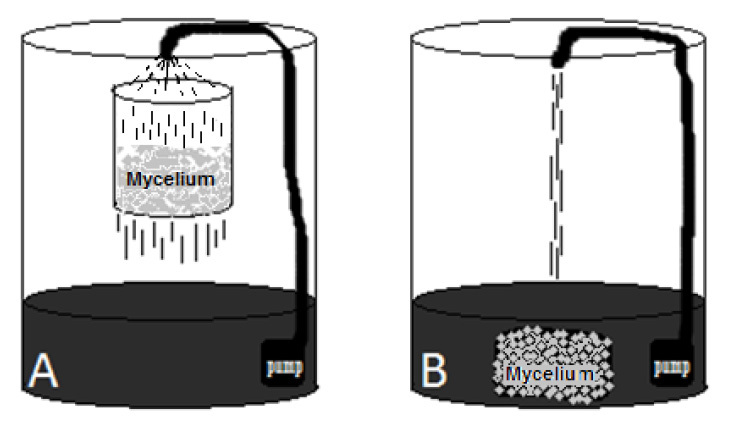 Figure 3: Mean decolorization values obtained with the funguses for the industrial effluent with A)percolation and B) submerged mycelia during seven days. 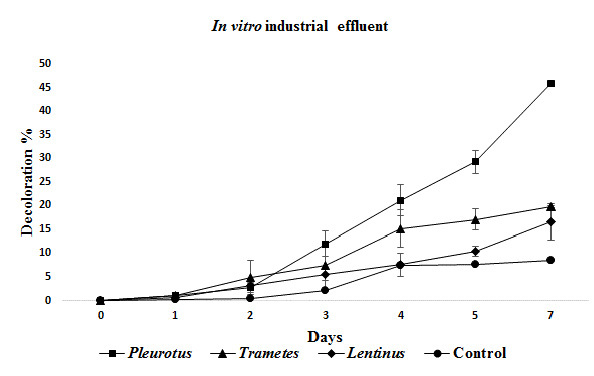 Better decolorization results were obtained for industrial effluent at in vitro tests, than in pilot scale tests by all three fungi, and once again Pleurotus showed the best values with 46%, statistically different than Trametes(19,7%), Lentinus (16,5%) and the control (8,5%) (Figure 4). Figure 4: Mean decolorization obtained for the industrial effluent at in vitro experiments. In both methylene blue concentrations, there were outstanding decolorization efficiencies, in almost all cases superior to 80% with all three fungi species at seventh day, with statistically differences to control tests. Trametesshowed the best results than the other two fungi, in both concentrations tested, with 95% in 100 mg/L, and 97% in 400 mg/L. (figure 5). Figure 5: Mean decolorization for methylene blue at in vitro experiments, two concentrations: A) 100 mg/L and B) 400 mg/L. These experiments corroborate the potential of WRF in water bioremediation; in this case, our experiments consisted in decolorization of a real industrial colored effluent in non-sterile conditions, with promising results. An evaluation which has been poorly explored18, 23, 25. This colored industrial effluent was decolored up to40.1% only by Pleurotus, when its biomass set submerged entirely, while in percolation the decolorization failed. Trametes and Lentinus did not exert significant decolorization in both contact methods. At in vitro scale the results were similar, though slightly superior (Pleurotus: 46%; Trametes: 19,7%, and Lentinus:16,5%), The decolorization value with Pleurotus obtained here is slightly superior to the obtained by 24, of 40% decolorization in a real non-sterile effluent after 8 days with Bjerkandera, and 65% in the same affluent, but sterilized. The similar decolorization values of industrial effluent at both scales by Pleurotus coincide with 27, who obtained scarce different production levels of Manganese peroxidase in 5 and 30 Liter reactors, using Nematoloma frowardii. This led us to speculate that decolorization of industrial effluents with Pleurotus are easily scalable. Equally27explains that optimal scalability of ligninolytic enzymes production is attained when is a sheer effect[G74] is kept as low as possible in bigger reactors. Both scales used here had no shear effect because in pilot scale agitation was by recirculating the liquid, and at in vitro only was used an orbital shaker. The different decolorization values of Pleurotus from Lentinus and Trametes may by partly because of Pleurotus pulmonarius has the best tolerance to the specific chemical composition of the industrial effluent used thanTrametes and Lentinus. In that sense,28 report high tolerance to the toxic phenol for 22 Pleurotus species, grown in agar and in non-sterile wheat straw soaked in that substance. Likewise 13 found the ability of Pleurotus ostreatusto survive and do decolorization in very high concentrations of three reactive industrial dyes, with the laccase as the predominant enzyme, which increased its activity as increasing dye concentration to 2000 mg/L. On the other side, possibly some salts present in the effluent inhibits stronger the enzymes in Trametes and Lentinusthan inPleurotus. This effluent comes from various industrial fabrics dying processes. Thus it is composed of a very complex mixture of various unknown dyes and salts24.In this respect, 15 found high decolorization rates withPleurotus, Trametes and Phanerochaete for single dyes in salinity conditions, but they found terrible results when salt concentration reached 20 g/L because under this condition there is strong enzyme inhibition exerted by the high osmotic pressure. Also29 found in. crinitus better activity of laccase and manganese peroxidase, when the culture medium was supplemented with Mn2+, ethanol or Cu2+, then those salts may act as cofactors for some enzymes related to the process. Contradictorily, 24 attribute their good decolorization results in a real effluent byBjerkandera to the salinity contained in such effluent, but they do not report salt concentrations. The papers mentioned above shows the different tolerance of the fungi to salinity, which may explain the different decolorization values shown here by the three fungi. For methylene blue, which was assayed here only at in vitro in shake flasks, there were excellent decolorization values, ranging from 80 to 95%, with all three fungi, in both concentrations assayed (100 and 400 mg/L). It seems more natural for the fungi to effect decolorization when setting with single dyes, as frequently reported by others, like 17who obtained 92% in 9 days with Coriolus (=Trametes) in Everzol Turquoise Blue G;8achieved 99% in blue 19 after 15 days; 30 reached 92% in Reactive Black 5 (non-sterile), 8 days with Trametes; 2 90% decolorization of reactive blue 220 in10 days using Lentinus crinitus; and 13 97% with Trametes pubescens and Pleurotus ostreatusin reactive blue 19. However, the novelty in our results is the demonstration of good decolorization for methylene blue in high concentrations, and non-sterile conditions by the WRF tested, and the same goal is possible for real colored industrial effluents at bigger scales, especially with Pleurotus. Methylene blue was decolorized (95%) with significantly best results than the industrial colored effluent 46%byPleurotus. Maybe these differences are due to the indigenous bacteria in the effluent, interfering with a more optimal enzyme expression by the fungi. This same trend was observed by 24, who obtained 70% decolorization four diluted dyes in eight days, while they obtained only 40% in a real effluent at non-sterile conditions using Bjerkandera. The authors found six million contaminating bacteria per milliliter in the effluent; then decolorization was reduced by competition between fungi and bacteria. Similarly,25 reports bacterial contamination as the main responsible factor to the high reduction in decolorization efficiency under non-sterile conditions, after various cycles with immobilized Trametes versicolor. Ten days after finishing the pilot-scale experiment with the industrial colored effluent, we observed fruiting in all Pleurotus mycelium blocks, with the same result for submerged and percolation blocks (100% fruited blocks in both experiments). This result is following 11 who reported Pleurotus ostreatus grown in sawdust and used for bioremediation of polluted soil with 2% hydrocarbons, showing regular fruiting after four weeks, and high contaminants reduction. This fungus like other edible cultivated mushrooms is known by its response to a sudden change in humidity, resulting in a flush of mushrooms even in 20 days old inoculated substrate. In this study, the ability to produce fruiting after seven days soaked in dyes contaminated water by Pleurotus, confirms its high resistance to chemical substances, and it is potential as a tool for water bioremediation. Trametes and Lentinus did do not fructify at all, but maybe the time for fruiting in those fungi is longer than the studied here. For example,Trametes versicolor inoculated in apple plants, produce fruiting after six months 31. On the other side, hey used here as support for the mycelium influenced positively the excellent results obtained here for Pleurotus in the effluent and all tree fungi in methylene blue. That substrate like many similar gramineous plants have a high proportion of lignin and cellulose, so they are usedtraditionally to produce many edible mushrooms commercially 11. That was the main argument to use hay for mycelium propagation in the present decolorization experiments. Some authors report repeatedly superior results in decolorization processes when using immobilized WRF compared with suspended mycelium, especially when using organic supports 12, 30,32because those supports maintain a constant growing active mycelium, capable of producing the ligninolytic enzymes for a prolonged period. For example,33 found that P. chrysosporium enhanced its decolorization by using sunflower seed shells as support, which influenced both the type and proportion of the produced enzymes responsible of dye decolorization. Equally,34report higher lignin peroxidase and Manganese peroxidase production in Lentinus crinitus grown in banana shoots-leaves compared to banana fruits-leaves, mainly because to the difference in lignin-cellulose content in those materials. Therefore, this is a valid argument to use lignin-cellulosic composed substrates, as support to produce decomposing wood enzymes from WRF, as an economically viable alternative, for different biotechnological goals, including dyed water bioremediation. This research was supported by Sistema de Investigación & Desarrollo, Universidad Católica de Oriente and the industrial water treatment plant “La Cimarronas”. Then the authors want to be thankful to Dagoberto Castro Restrepo and Gladys Palacio Montoya. 1. RojasR. A, Medina J. F.Estudio de cooperación entre Colombia y Corea del Sur en el sector textil-confecciones.Civilizar. 2012; 12(22):143-56. URL: http://www.scielo.org.co/scielo.php?script=sci_abstract&pid=S1657-89532012000100009&lng=es&nrm=is. 7. Ghasemzadeh R., Kargar A., Lotfi M.Decolorization of Synthetic Textile Dyes by Immobilized White-Rot Fungus. International Conference on Chemical, Ecology and Environmental Sciences. (ICCEES). 2011. Dec.Pattaya, Thailand. 1, 2, 3: Departamento de ciencias exactas y naturales. Universidad Católica de Oriente, Sector 3, cra. 46 No. 40B 50. Rionegro, Antioquia, Colombia. A.A. Rionegro: 00​8. 3: Autor de correspondencia: Departamento de ciencias exactas y naturales. Universidad Católica de Oriente, Sector 3, cra. 46 No. 40B 50​. Rionegro, Antioquia, Colombia. A.A. Rionegro: 00​8. Teléfono: +(57) (4) 569 90 90 ext: 275. sigr06@gmail.com. Fax: +(57) (4) 531 39 7​2.